Each time you make a reservation through this website, your reservation is made directly with Papaevangelou Hotel. As such, you are guaranteed the lowest possible rate, unlike reservations made through third party systems (whose prices include the given platform’s commission). To send a reservation enquiry directly to Papaevangelou Hotel click here! 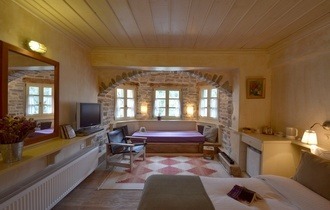 Papaevagelou Hotel is located in the most beautiful village of Zagori, Papigo. In lush-green surroundings with an amazing panoramic view of Astraka (243m/800ft) and the unique natural beauty of the Vikos Gorge, you can enjoy excellent service and hospitality. It is located 62km (39miles) from Ioannina City, at an elevation of 980 metres (3215ft). 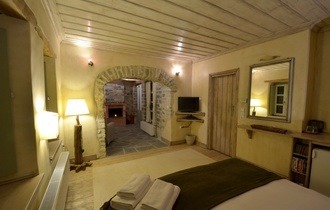 Papaevagelou Hotel is built according to the traditional Zagori region architecture. The materials used for construction are 100 hundred-year-old traditional materials. 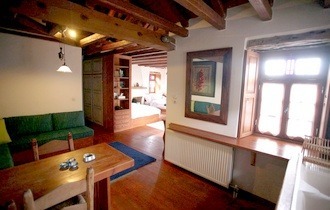 During your stay you can see all the sights of the village and the area. Sports lovers can cross Voidomatis river, either rafting or kayaking from the Papigo bridge to the Voidomatis bridge.